Sunshine, humidity, and heat will be on the docket for the region today. Most of us will see mostly sunny skies today and given our warm start in the 70's in the city, the prospect of a 90 degree day is quite high. We will stay dry in most of the region today as well -- some pop up thunderstorms could develop out across Central Pennsylvania, with modeling suggests those tracking northeast through the course of the day and staying to our west and northwest through the day. Any storm that fires to the west could produce some localized downpours. Those should avoid the city today. For us, heat and humidity. 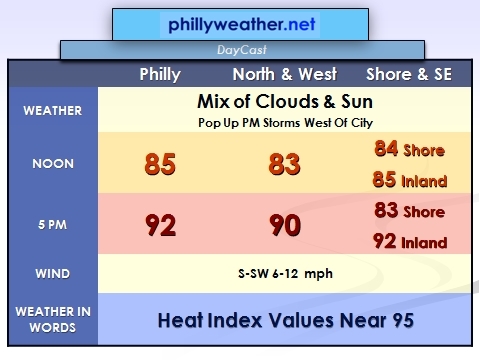 Heat index values of 95, perhaps a notch or two higher. Temperatures in the lower 90's throughout the region. The forecast high of 92 in Philly will avoid the record of 98 by several degrees. This may end up being the last blast of 90 degree heat for the year. If you like heat, enjoy today.